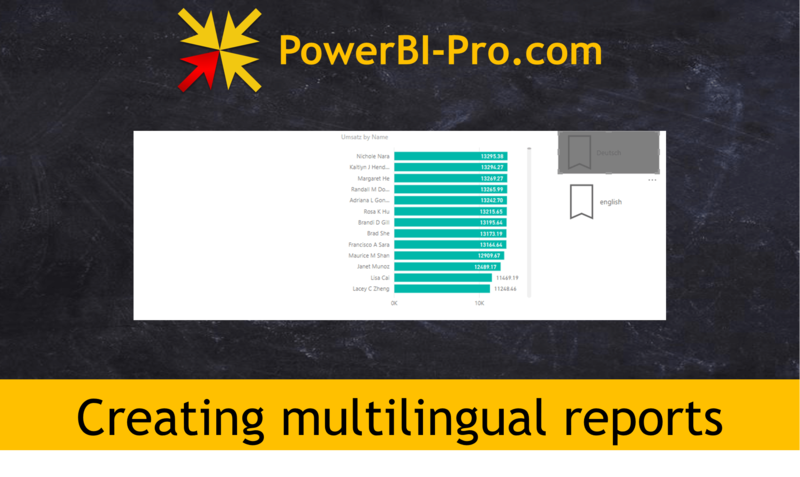 As of today (October 22, 2018), it is not possible to automatically create multilingual reports in Power BI. That’s why I show in this article how multilingual reports can still be created with a small workaround. It may be a customer request that the reports have to be displayed in either English or German. Both the column headings in the tables and the measures should be displayed in the required language. However, the contents of the individual fields do not have to be changed. This means that the product name “RoadBike” can remain unchanged. If you are looking for a solution for changing the values in a column, I can recommend you the Youtube video by Ruth Pozuelo (curbal.com) and the one by Adatis . Furthermore, the measures must be translated (for example, “revenue” must become “Umsatz”). The visuals should be displayed depending on the selected language. The report recipient should be able to change the language with as little effort as possible. The first challenge is easy to solve. What we need is a parameter in Power Query. I named the parameter pmt_Language and have two choices: “German” and “English”. The parameter needs a name (1) as well as a selection option (2). In this case this will be a list which is defined below (3) with “Deutsch” and “English”. As default value (4) I have defined “Deutsch”, which also corresponds to the current value (5). For this example I have created a data set consisting of two tables “Sales” and “Customers”. With the created parameter we can now also easily adjust the column headings. To do this, we enter an if-then condition in the Advanced Editor. This condition checks which language was selected in the parameter. In the case of English, the table remains unchanged, since the source language of the table is English. When writing the “Revenue” measure, Power BI immediately responds with an error message. Since the language is set to “Deutsch”, DAX does not find the column Sales[SalesAmount]. We’re ignoring that mistake right now. Next, at the center of the report layout, we create a normal bar graph consisting of the Name column and the “Umsatz” measure. The report user should be able to change the language as easily as possible. All we have to do is change the value of the parameter in the user interface. English” is selected as the new language. Power BI tells us that we still have to activate the change. Now we immediately receive an error message in the visual. We can ignore the message and create a new bar chart on the left, this time with the English terms. Now we create two bookmarks. The first bookmark “bm_english” hides the German visual, the bookmark “bm_deutsch” shows only the German visual and hides the English visual. Here are the settings for the English bookmark. The red mark shows the hidden status of the German visual. Unfortunately at the moment bookmarks cannot be selected depending on values. The selection of the selected bookmark is done via the user interface. Therefore we have to create two new buttons and specify the bookmark you want to use. The bookmark buttons can be created as follows. .. and the associated action for the button, activating the bookmark “english”. The same settings must also be made for the German button. The user only needs to change the parameter and select the desired bookmark to change the language of the report. The two diagrams could also be overlayed so that the user does not see any difference. With a few simple steps, the report language can also be adapted in Power BI. Of course, the work with more extensive data sets with a large number of tables is bigger. But until Power BI can handle multilingual reports, this is a viable workaround. You can download the file of the post here. Find out more about Power BI here.